Los Angeles has been, collectively, freaking out for weeks now about the two-day closure of a long stretch of the 405 (one of the city's major highways) and now, finally, that day is upon us. And it's not really that big of a deal. But not all was overblown! JetBlue got some nice publicity out of the whole thing by offering a $4 flight from Burbank to Long Beach, and bicycle activists got some too by staging a "race" between a group of cyclists and JetBlue plane—and winning handily. (They reached their destination just when the plane had taken off.) 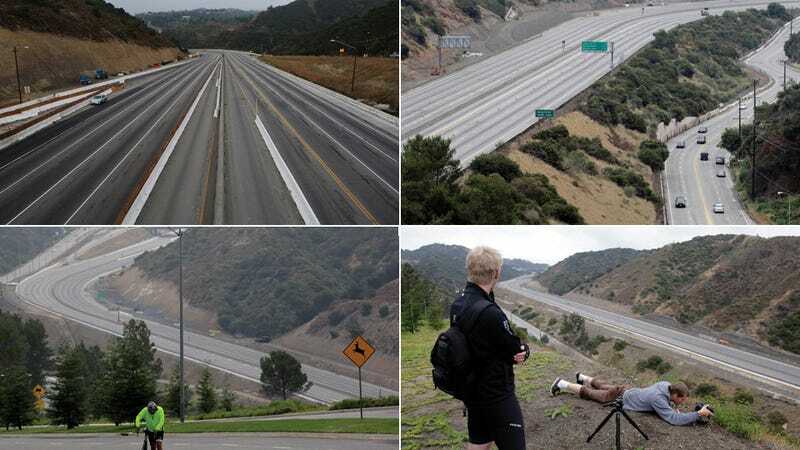 And Los Angeleno Heather Grimmer took this video while driving down an empty 405. It's kind of the Los Angeles equivalent of the opening scene in Vanilla Sky.